Breeders have concentrated on retaining the Herdwick as an active and strong boned sheep of good conformation. We believe that it is this which enables the Herdwick draft ewe to produce such a good cross-bred lamb. Texels, Suffolks and increasingly Charollais tups are used as crossing tups with Herdwicks. Cheviot cross Herdwick lambs also represent a good crop. All these crosses are widely sold store at the back-end of the year to lowland farmers looking for a long keep lamb which will reach between 35-40 kg liveweight at the time when the fat market is at its strongest. In recent years much success has also been had with crossbred lambs out of Herdwick ewes on the lightweight lamb trade. 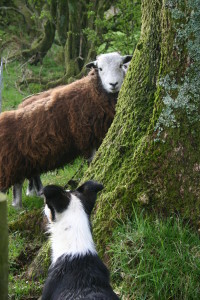 Given the breed’s admittedly low quality and low value wool it is not surprising that there has been a tendency to breed for a tight and short fleece, although some breeders still prefer a longer and lighter coloured wool. There seems to be no significant difference between the performance of either type. One fact about the Herdwick fleece based on practical experience on many farms is that Herdwicks do dry out quicker than white woolled breeds after rain.